Boitumelo "Melo" Moloto is a South African television presenter best known for hosting the SABC3 tween variety programme Hectic on 3. She previously co-hosted - with Aphiwe Vincent Kani - the SABC3 cooking tween show Yum.Me. Having attended Pretoria Girls High School from 2010-2014, Melo has a self-professed passion for broadcast media and aspires to be a successful journalist and media mogul. Her father is a former journalist and she studied journalism at the Cape Peninsula University of Technology from 2015. 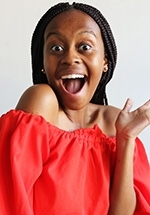 She was given the opportunity to join Hectic Nine-9's Takeover campaign in the hope that she would become a presenter on the show. She didn't get the role, but a short while later she auditioned for - and won - the role of Yum.Me co-presenter. In 2018, when the decision was made to expand the SABC2 teen show Hectic Nine-9 to include a tween version on SABC3 called Hectic on 3, Melo was chosen as the show presenter.